Marie K. Smith represents clients in all aspects of corporate and commercial law, with a particular focus on banking, securities, mergers & acquisitions, corporate governance, and general corporate matters. 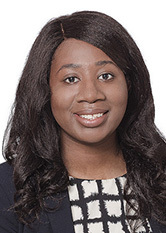 Marie is a graduate of Indiana University Maurer School of Law, where she focused her studies on corporate law and completed a JD/MBA joint degree program. Her MBA studies were conducted at Sungkyunkwan University in Seoul, South Korea. Marie also spent a semester as an exchange student at Ewha Womans University. Prior to her studies at Indiana, Marie majored in finance at Howard University.